The authors conducted a randomized, double-blind, placebo-controlled, twofold crossover study in 16 patients with MS who presented with severe spasticity to investigate safety, tolerability, and efficacy of oral Δ9-Tetrahydrocannabinol (THC) and Cannabis sativa plant extract. Both drugs were safe, but adverse events were more common with plant-extract treatment. Compared with placebo, neither THC nor plant-extract treatment reduced spasticity. Both THC and plant-extract treatment worsened the participant’s global impression. Evidence suggests that cannabinoids can relieve muscle spasticity and other symptoms in MS.1-3⇓⇓ The hemp plant (Cannabis sativa) is the unique source of compounds known as cannabinoids, including the major psychoactive Δ9-Tetrahydrocannabinol (THC) and the nonpsychoactive cannabidiol (CBD).4 Discovery of both the cannabinoid receptors, present throughout the CNS and the peripheral immune system, and the endogenous cannabinoid system has strengthened scientific interest in the field.4 Many patients with MS are already using cannabis to alleviate their symptoms.4 However, results of the few small- and short-term clinical trials have been equivocal, and the majority of patients experienced unpleasant side effects.2,4,5⇓⇓ We performed an additional study analyzing two products—synthetic THC and a cannabis plant extract with THC and CBD. We studied 16 patients with progressive MS (10 with secondary progressive [SP] and six with primary progressive [PP] MS). Patients were eligible for study if they had disease duration >1 year, severe spasticity (mean Ashworth spasticity score6 of 2 or more in at least one limb) during screening, and Expanded Disability Status Scale (EDSS) score between 4 and 7.5. Exclusion criteria included other disease of clinical importance, use of other investigational drug, disease exacerbation, steroid treatment or use of cannabinoids in the 2 months preceding study entry, and history of alcohol or drug abuse, depression, psychosis, or schizophrenia. The study was approved by the Ethics Committee of the VU Medical Center, and patients gave written informed consent. After a screening visit, regular visits were scheduled at days 1, 14, and 28 and weeks 8, 10, 12, 16, 18, and 20. Patients received identical-appearing capsules containing dronabinol (THC = Marinol®, Unimed Pharmaceuticals, Inc.), C sativa plant extract (standardized THC content = 20 to 30% CBD and <5% other cannabinoids, Society for Oncological and Immunologic Research, Germany), and placebo for 4 weeks each. During the first 2 weeks, study medication was administered in two daily doses of 2.5 mg THC or plant extract, containing the same level of THC. If well tolerated, the dose was elevated to 5 mg twice a day for the next 2 weeks. Patients were asked to take the capsules exactly 1.5 hours before the planned assessments during visit days. There was a 4-week washout between treatment periods. Patients underwent physical examinations and safety blood and urine tests throughout the study. An EKG was performed at enrollment, and women underwent pregnancy tests. Patients were not allowed to drive or to operate machinery while taking the drugs. To avoid unmasking, a “treating” physician was responsible for general medical care and safety management, whereas an “assessing” physician was responsible for the neurologic tests. Muscle tone was measured using the Ashworth scale6 (0 = normal, 1 = slight increase, 2 = more marked increase, 3 = considerable increase, 4 = limb rigidity in flexion or extension) for elbow flexors, extensors, pronators, and supinators; wrist and finger flexors; hip adductors; knee flexors and extensors; and foot plantar flexors bilaterally. Disability/impairment was measured using the EDSS, including functional systems, and a composite score (MSFC) of leg function/ambulation (timed 25-foot walk), arm/hand function (Nine-hole Peg Test), and cognition (Paced Auditory Serial Addition Test).7 Subjective changes were assessed using questionnaires including the MS-specific Fatigue Severity Scale, the Medical Outcomes Study Short Form 36,8 and a health-related quality of life questionnaire.9 In addition, daily Visual Analogue Scales were used to assess changes in spasticity, pain, tremor, fatigue, concentration, micturition, walking, vision, mood, and participant’s global impression. Incidence of adverse effects (AE) was analyzed by Cochran–Mantel–Haenszel tests. Efficacy was analyzed using a mixed linear model in case of interval data. Categorical and binary data were assessed by generalized estimating equations within a generalized linear model. p Values <0.1 were considered as statistical trend, and p values <0.05 as significant. Mean age was 46 years (SD = 7.9), mean disease duration was 15 years (SD = 10.7), and mean EDSS score was 6.2 (SD = 1.2). Six patients had used cannabis before, none on a regular basis. All patients completed the study, and none of the scheduled visits was missed. Both THC and plant-extract capsules were tolerated well. No serious AE emerged. 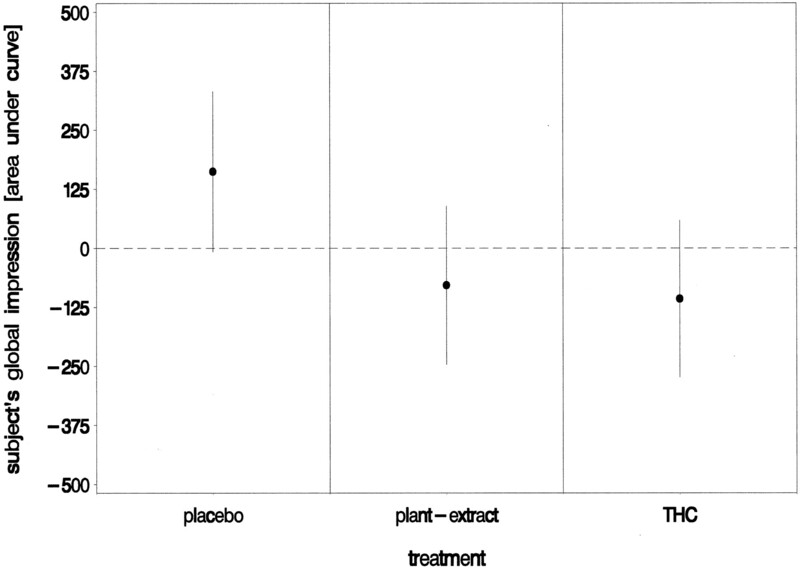 AE were more common during plant-extract treatment compared with placebo treatment (OR = 1.9, χ2 = 6.6, p = 0.01). Five patients reported increased spasticity during plant-extract treatment (table 1). One AE was rated as severe—acute psychosis lasting for 5 hours after the scheduled dose increase of plant extract. No clinically relevant changes were observed for physical examinations or in hematology or chemistry measurements. Compared with placebo, active treatment did not result in significant differences of muscle tone (figure 1) or EDSS score. However, worsening was found in the brainstem functional systems score (F = 4.3, p = 0.08) during plant-extract treatment, as well as in the total MSFC score (F = 4.6, p = 0.09) and the Nine-hole Peg Test score (F = 7.6, p = 0.02) during THC treatment. No significant change was found in fatigue. Although the Medical Outcomes Study Short Form 36 “mental health” subscale score (F = 8.1, p = 0.02) and the health-related quality of life questionnaire domain “psychological status” (F = 8.1, p = 0.02) improved during THC treatment, this was offset by worsening of the Visual Analogue Scale “subject’s global impression” score (THC: F = 9.2, p = 0.01; plant extract: F = 7.1, p = 0.02; figure 2). During THC treatment, a trend for deterioration was found in the Visual Analogue Scale “walking” score (F = 5.0, p = 0.08). No significant differences were found in Visual Analogue Scale scores rating spasticity. Figure 1. Change in Ashworth score in 16 patients with MS after 4 weeks of treatment (placebo, Cannabis sativa plant extract, and Δ9-Tetrahydrocannabinol). Mean and 95% CI are shown. The mean muscle tone score was calculated by dividing the sum score by the number of joints assessed. Decreasing scores represent improvement of spasticity. There were no significant differences in changes during active treatment compared with placebo. Figure 2. Change in daily Visual Analogue Scale “subject’s global impression” score in 16 patients with MS after 4 weeks of treatment (placebo, Cannabis sativa plant extract, and Δ9-Tetrahydrocannabinol). Mean and 95% CI are shown. Scores less than zero represent worsening of a “subject’s global impression” compared with baseline. 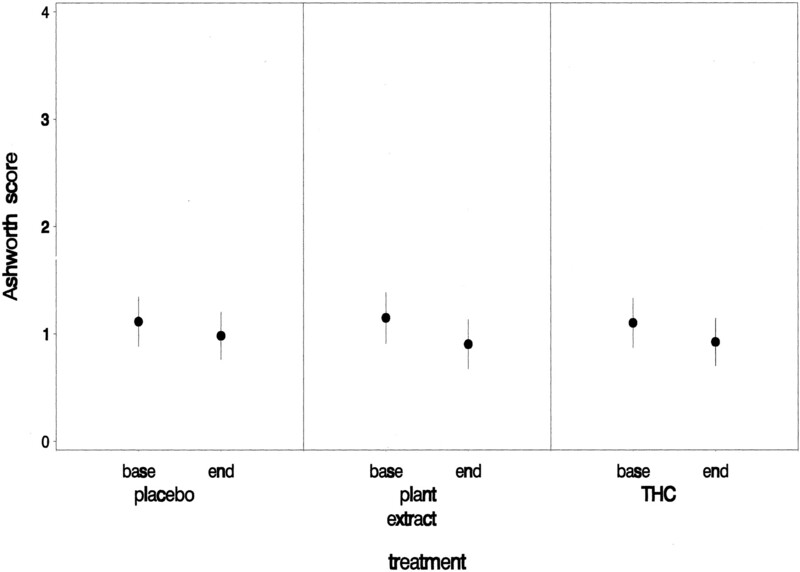 Compared with placebo, both THC (F = 9.2, p = 0.01) and plant-extract (F = 7.1, p = 0.02) treatment resulted in lower scores. Both patients and “treating” physician often guessed correctly whether the patients were on active treatment. However, the assessing physician guessed correctly only 25% of the time during placebo treatment and 31% of the time during plant extract and THC treatment, and stated “do not know” 50% of the time on average. No safety concerns emerged during the trial, and most AE were rated as mild. Because of the limited sample size no definite conclusions can be drawn. However, the results do not suggest therapeutic benefit of either THC or plant-extract treatment. A recent report suggested that cannabinoids can alleviate spasticity in mice with chronic relapsing experimental autoimmune encephalomyelitis.1 However, the compounds were used at concentrations that are not likely to be tolerated in humans.10 Results of an early study in patients with MS (n = 9) suggested that single doses of either 5 or 10 mg oral THC reduced spasticity.2 In a second pilot study with oral THC (n = 13), objective outcome measures were unchanged. However, the patients’ self-report was that spasticity significantly improved.3 In a single-dose study of smoked cannabis involving 10 healthy volunteers and 10 patients with MS, some patients noted subjective improvement.5 However, objective measurements of posture and balance showed that the drug impaired these functions in both the healthy volunteers and the patients. Although the sample size is too small to be conclusive, our study is currently the largest and the longest study addressing cannabinoid therapy in MS. A possible explanation for the lack of efficacy could be the route of administration. THC is absorbed reasonably well from the gut, but the process is slow, with a large range between and within individuals.4 A second possible explanation could be the prescribed dose. However, the number of AE, especially during plant-extract treatment, does not support the use of higher dosing regimens. The plant extract used in this study contained 20 to 30% CBD. Animal studies have demonstrated that CBD administration interferes with drug metabolism in the liver and was associated with a substantial increase in CNS concentrations of THC. The increase in AE during plant-extract treatment was not accompanied by a positive trend in efficacy, therefore making it unlikely that persistent higher CNS concentrations of THC would be well tolerated and would lead to more favorable results. Supported by the Dutch Ministry of Health, Welfare and Sport. The authors thank Dr. B.M. Zaadstra and Dr. L.M.L. van Winsen for help with design and execution of the study. Baker D, Pryce G, Croxford JL, et al. Cannabinoids control spasticity and tremor in a multiple sclerosis model. Nature . 2000; 404: 84–87. Petro DJ, Ellenberger C Jr . Treatment of human spasticity with delta 9-Tetrahydrocannabinol. J Clin Pharmacol . 1981; 21 (suppl): 413S–416S. Ungerleider JT, Andyrsiak T, Fairbanks L, Ellison GW, Myers LW. Delta-9-THC in the treatment of spasticity associated with multiple sclerosis. Adv Alcohol Subst Abuse . 1987; 7: 39–50. Iversen LL. The science of marijuana. New York: Oxford University Press, 2000. Greenberg HS, Werness SA, Pugh JE, Andrus RO, Anderson DJ, Domino EF. Short-term effects of smoking marijuana on balance in patients with multiple sclerosis and normal volunteers. Clin Pharmacol Ther . 1994; 55: 324–328. Ashworth B. Preliminary trial of carisoprodol in multiple sclerosis. Practitioner . 1964; 192: 540–542. Stewart AL, Ware JE. Measuring functioning and well being: the medical outcomes study approach. London: Duke University Press, 1992. Pfennings LE, van der Ploeg HM, Cohen L, et al. A health-related quality of life questionnaire for multiple sclerosis patients. Acta Neurol Scand . 1999; 100: 148–155. Di Marzo V, Bifulco M, De Petrocellis L. Endocannabinoids and multiple sclerosis: a blessing from the “inner bliss”? Trends Pharmacol Sci . 2000; 21: 195–197.